You are here: Home / How-to Graphics / 20+ EASY Ways to Make Picture Quotes Online! UPDATED April 2019: Since I first published this list in January 2013, a lot has changed. Some sites have gone offline, so I’ve eliminated them. Some hot sites have emerged, like Canva and PicMonkey. And more options have been added by readers. Check out the expanded list, and choose what YOU need! Note: I’m an affiliate for some tools I’ve tried and loved. This means I may make a referral fee if you upgrade to a paid version, at no cost to you. This is my favorite tool when you don’t know what to say – because you can search quotes by topic, right inside! Find your quote, pick a template and a background, change out fonts to suit your branding, add your logo – and you’re done! You can learn more about using Stencil to make quote images that build your business here. Plus, I’ve included a sample below. The Pro version offers so much more, for only $15 per month – or save 40% by paying for a year in advance! Why not give Stencil a whirl to create quotes online? Make picture quotes easily with Stencil! 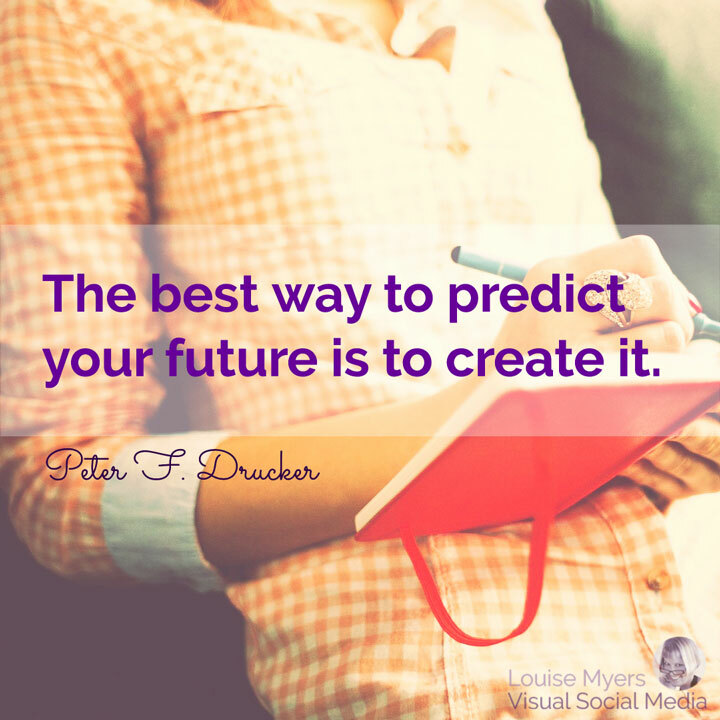 PicMonkey: Make quotes with your own pictures! 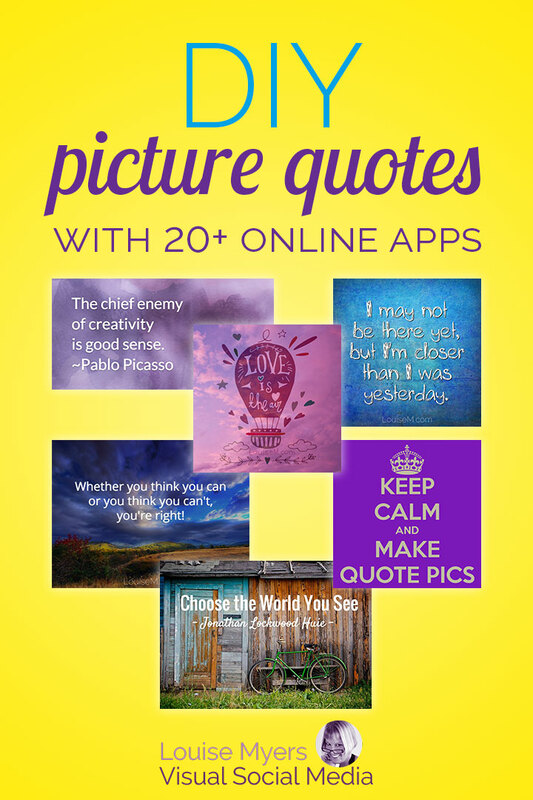 If you’ve got your own photos and want to add quotes to your pictures online, PicMonkey’s the one for you. It’s a photo-editing quote maker! So you can tweak your photos before you add text. Its editing capabilities are powerful and easy-to-use, so you’ll never need another photo editor. And it’s sooo much easier than using Photoshop. And it comes with so many fun templates and holiday themes! You can create an amazing professional design in a few minutes – without the design degree! I’ve shared just one cool graphic below. Start with a blank canvas, a photo, or a customizable template. Edit photos like a boss: Powerful enhancements create big-impact effects. Pics are auto-saved as editable files stashed in your Hub (cloud storage). Fully loaded with graphics, fonts, templates, and more. Or add your own fonts, logos, images — and match your brand colors. Edit and design anywhere! With your PicMonkey subscription, you get all of PicMonkey.com plus the free mobile app. Start a project on PicMonkey.com. It’ll auto-save to the cloud. Open the PicMonkey mobile app and log in to find your project. Finish editing your image and share. Try the reverse, too—start in the app and finish at PicMonkey.com. So many options! 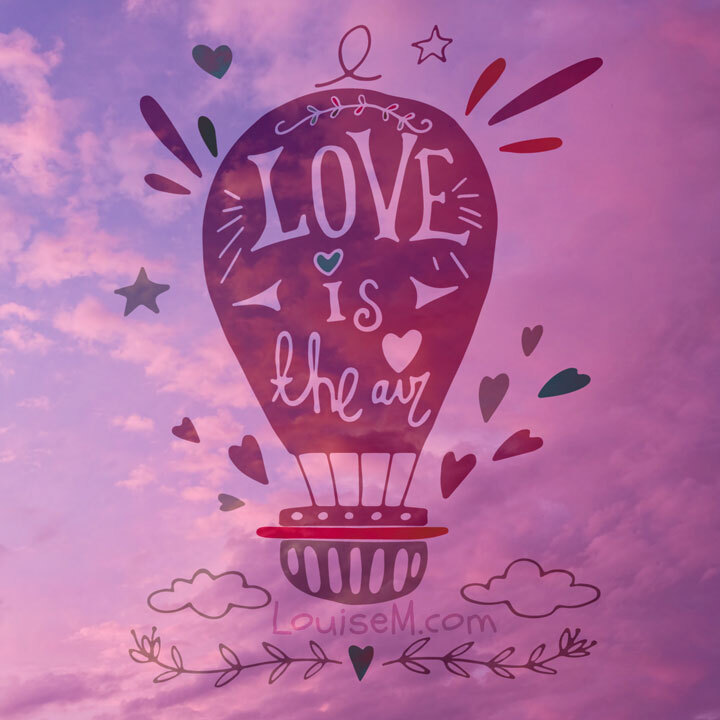 How To Make Valentine Graphics They’ll Love. It’s Easy! How to Halloween Your Blog and Profile Pictures: Fun & Easy! But why wait! Ready to get creative? Try PicMonkey out! Note: When you’re ready to save or share an image, you must purchase a plan, starting at $7.99 billed monthly or $71.88 for a full year. Add quotes to your pictures online with PicMonkey! Done-for-you quote maker for bloggers only! This is my favorite for sharing quotes from my blog. If you’re a blogger, check this out! It’s unbelievably easy, because it’s automated. Missinglettr automatically pulls in quotes from new blog posts and creates quote pictures and accompanying text, then schedules them to be posted over an entire year. If you’re on a paid plan, you can edit the quote templates to match your branding! Here are two templates I’m using. You can post to Facebook, Twitter, and LinkedIn. Over a year’s use, my automated posts from Missinglettr brought 20,000+ visits to my blog! There’s still a huge assortment of sites that allow more or less customization. Less can mean faster and easier! Most sites on my list are best for making quote pictures, plus a few are meme generators. Both have the potential for posts that go viral, so give ’em a try, if they suit your business brand. The three I’ve recommended above are created for small business owners. Some on the list below may provide a less professional-looking result. It may be OK to mix in memes once in awhile, but they may not be appropriate to your business. Proceed with caution. I’ve included my own synopsis under each site’s name, which is a clickable link. As you try the sites, give them a “thumbs up” or “thumbs down” so others know which are best liked. You can read an in-depth comparison of my favorite design tools, and download a free comparison chart, in this post about design tools for non-designers. The six you’ll find there are all suited to business use. Know any other online tools to make picture quotes and memes? Add them to the list! To make sure my readers get the best information, the list is moderated. I’ll check out and approve quality site suggestions! If you like the list, you can embed it on your own website! Just click the “Embed List” button and get the code (it’s up near the top of the list, to the left of the tiny social buttons). Want to pin a quote graphic from the list? Switch to Magazine format, hover any image in the list, and pin, tweet, or Facebook share the image. Too many choices? Let’s simplify. Best free online quote maker: Find the right quotes to share on social media with Stencil. Then make them into images with a few clicks. 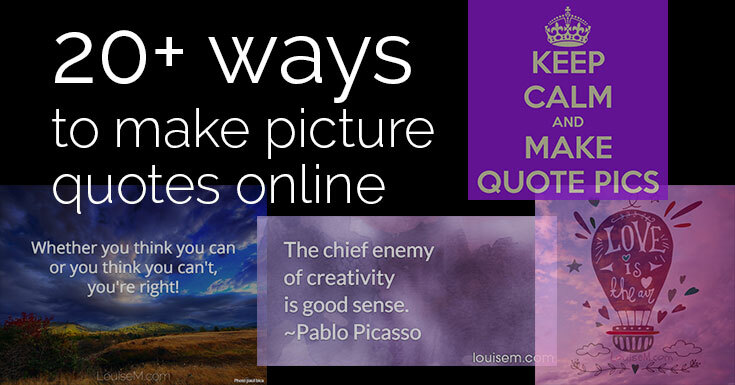 Best tool to make your own quotes with your own pictures: PicMonkey combines powerful photo editing with fun templates and graphics! Best quotes tool to promote blog posts: Missinglettr. It makes quote graphics from your own words! Pin this post to refer to later. These choices will help you make picture quotes FAST! It can be even simple that if you are using a Windows computer you definitely can use MS Paint to do this kind of stuff yet it is a little tricky to manage. On many android phones you can add quotes without any problem with the phone’s editor. Now everything is being provided online, the sites you mentioned are also very helpful yet you have to deal with the advertisements on many of them. The online sites make it easy. I recommend paying for a tool like Stencil. It has quotes and images included, and no annoying ads. Neither of those exist any more. They were fine, if limited, while they lasted. to submit to media groups? You would have to check the terms of the apps as well as if the quotes are in the public domain. Could you share which device or browser you’re using? On mobile they shouldn’t appear at the side. However I may need to reset the browser width that forces them to the top vs side. Thanks! i do have a question. what is a quote means?